Your permissions either denote the operations available to you as a reseller in Plesk, or define which services and privileges can be enabled in the subscriptions of your customers. If a particular permission in your reseller subscription is set to Off, then a service subscription will not provide the corresponding service or a privilege. A disabled permission also means that you are prohibited to perform the designated action in the Customer Panel. For example, if your subscription does not provide a privilege to use Scheduler (Scheduler management is Off), then none of your subscribers will be able to use it, and neither will you. Subscription creation in Reseller Panel and domain creation in Customer Panel. Shows whether you can create hosting service subscriptions, add domains, create websites, and set up web forwardings. Ability to use XML API. Shows whether you can remotely manage Web sites through custom applications. The remote API is an interface that can be used for developing custom applications integrated with Web sites, which could be used, for instance, for automating setup of hosting accounts and provisioning of services for customers purchasing hosting services from your site. To learn more, refer to the Plesk Onyx: XML API Protocol Reference. Access to Plesk. Shows that you can use the Plesk graphical user interface. Customer account creation. Lets you create user accounts and subscriptions for your customers in Plesk. Allow overselling. Lets you set up oversell policy, meaning that you yourself can define if overselling is allowed to you or not. Overselling allows you to sell more resources than is allocated with a plan. If overselling is allowed, a reseller is governed by actual resource usage instead of initial resource allocation. Overselling is a marketing strategy based on the following scheme: a reseller, who was allotted, for example, ten gigabytes of disk space, allocates five gigabytes of disk space for each of their customers, assuming that none of them will actually use all of their allocated disk space. Meanings of the other permissions are the same as in the service subscriptions. 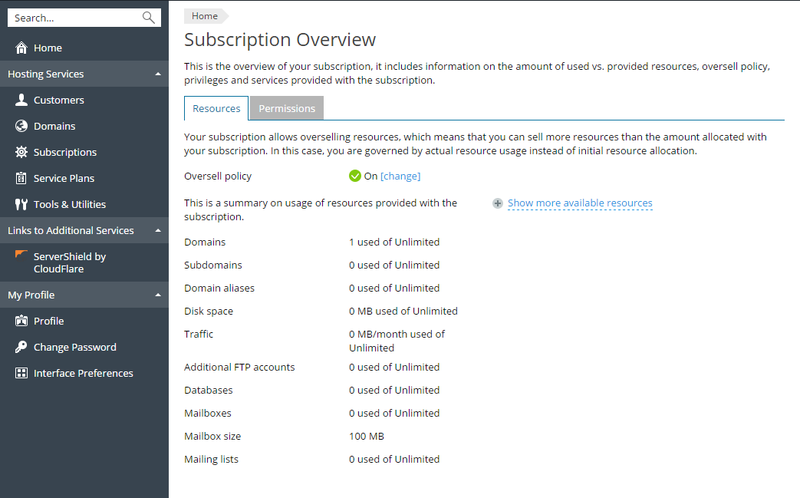 To view the full list of your subscription permissions, go to Home > My resources and permissions overview > Permissions tab.